The original version of this tune, as every self-respecting Queen fan will know, can be found on the 1974 album Sheer Heart Attack. The Metallica version is noteworthy in that it represents the only time the band have ever covered a tune because they were told to: it was commissioned by Electra Records as part of the a double CD entitled Rubaiyat intended to celebrate their 40th anniversary. The easiest way to track down the recording now is to find the Garage Inc album, which includes ‘Stone Cold Crazy’ under the heading ‘B-Sides and One-Offs, 88-91′. Although it may seem uncharacteristic that Metallica ended up covering a Queen tune, it should be borne in mind that Brian May’s distinctive layered guitar work was a huge influence on James Hetfield, who explains in the Garage Inc liner notes that: “Along with Thin Lizzy, what he did on those [Queen] records helped us a lot in using guitar harmonies in our songs”. Another song by Metallica For Whom The Bell Tolls already transcribed by TabsClub. Indeed, this is a pretty reverent cover – apart from the solos and little touches like the odd time passages (bars 43, 52-53) – the running order is pretty much the same and the main riffs are identical to the original version. The guitar sound is a little more contemporary in the Metallica Stone Cold Crazy version, and to emulate this you’ll need as much gain as you can muster, using the bridge pick-up and setting the EQ on the amp to boost the low and high frequencies while cutting the mid for the scooped sound sought by many metal guitarists. If you have a graphic EQ, set it in a V shape and then let your ears determine any necessary fine adjustments. You may find that a noise gate helps you to eradicate the unwanted handling noise which can creep in at these extreme gain settings. BTW, we prepared the biggest dictionary of music terms on the Internet with lots of definitions and explanations. Of course, playing technique is as important as any amount of knob-twiddling when it comes to getting the sound right. In general, the rhythm work all requires a touch of muting to prevent the woolliness which tends to accompany low notes through extreme amp settings – lean your right hand palm on the strings, right up against the bridge, and experiment with different amounts of pressure until you find a hand position which gives notes a tight percussive attack without putting them out of tune. James Hetfield is famed for his practice of using only downstrokes with his picking hand but, in this instance, I think it’s okay to use an alternate picking motion. With your hand doing downstrokes on every beat, and upstrokes in between, you’ll find that events like the Bb5 at the end of bar 8 or the ascending chromatic notes in bar 11 naturally occur on upstrokes. Once you get used to this you’ll find it easier to keep in time at the frantic speed of 252bpm. With regard to Kirk’s guitar part (left channel), you’ll find that much of the rhythm work overlaps with that heard in the right channel – but note the effect when he breaks out of unison in bars 20-23 and plays a variation an octave higher. Technically, the tricky parts are the tremolo-picked passages in bars 99-104, which should be practiced slowly at first so that your fretting and picking are sure to be in sync with each other. If the natural harmonics in bars 1 and 60 aren’t coming out, experiment with the placement of your left hand fingertip: it should be directly over the fret indicated and applying just enough pressure so that it “tickles” slightly when you pick the string. Failing that, adding more gain and treble on your amp should do the trick. You’ll note from the transcription that there are two guitar parts here – the right channel part is James Hetfield’s rhythm part and the left channel part features Kirk Hammett’s solos and additional rhythm work. 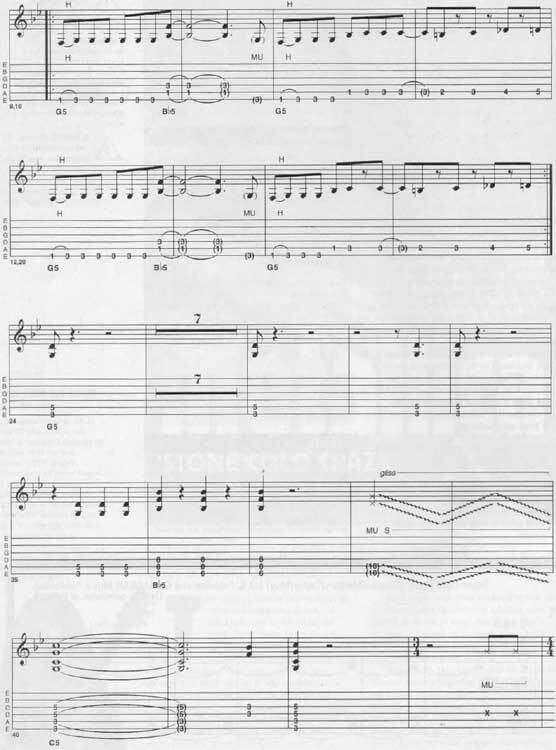 It’s just a part of Metallica Stone Cold Crazy guitar tab and sheet. © 2012 - 2019 TabsClub Powered by TabsClub 41 queries in 0.317 seconds.